This robin's egg blue cook book has long been a favorite of mine. It is not the type of book that I am usually drawn to. About the only thing decorative is the pale blue jacket and lettering that's a few shades darker. Within its' pages however is a relative treasure trove of recipes complete with a comprehensive index that is easy to navigate. I became curious about the book after watching an episode of Martha Stewart Living back in the nineties. Martha herself mentioned the book and I was curious what a woman like Stewart, who, let's face it knows just about everything, saw in this book. I found a gently used 1964 edition complete with fruit stains on the pie pages and quickly realized it's value. The format is simple with dual columns of black lettering and basic illustrations. It makes recipes for sauces, breads, custards and souffles more accessible with its' straightforward manner and no nonsense directions. 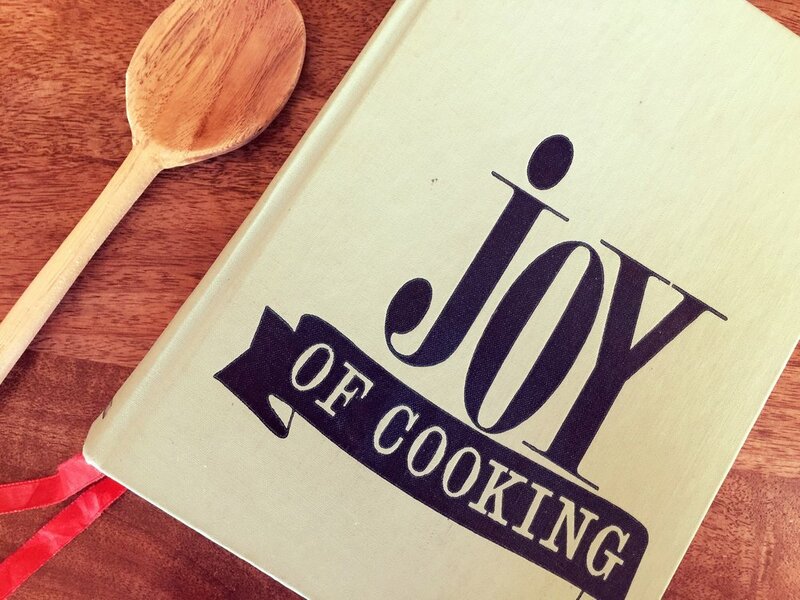 Upon reading, it soon becomes obvious that this is a cookbook written by people who value the effort behind a good home cooked meal: "We believe that you will go on to unexpected triumphs, based on the sound principles which underlie our recipes, and actually revel in a sense of new-found freedom. You will eat at the hours of your choice. The food will be cooked and seasoned to your discriminating taste. And you will regain the priceless private joy of family living, dining and sharing" (Joy of Cooking Irma S. Rombauer, Marion Rombauer Becker). I consider this book to be an excellent gift for a friend. It is a great resource for anyone interested in preparing food at home however, please consider buying a vintage copy.